Several prototypes of the synaptic transistor are visible on this silicon chip. Credit: Eliza Grinnell, Harvard SEAS. 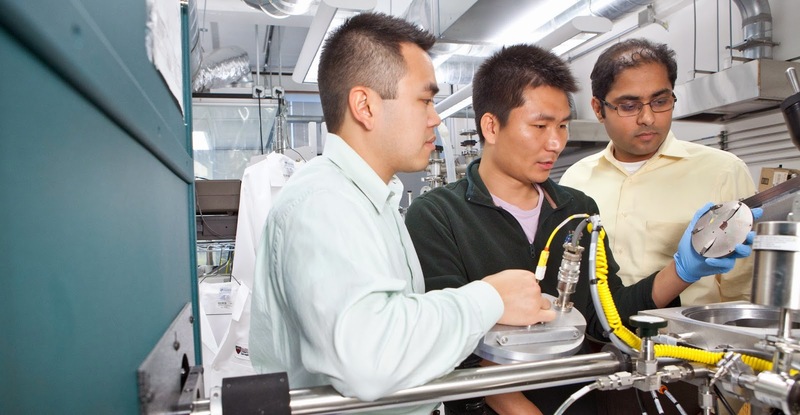 "There's extraordinary interest in building energy efficient electronics these days," says principal investigator Shriram Ramanathan, associate professor of materials science at Harvard SEAS. "Historically, people have been focused on speed, but with speed comes the penalty of power dissipation. With electronics becoming more and more powerful and ubiquitous, you could have a huge impact by cutting down the amount of energy they consume." In principle, a system integrating millions of tiny synaptic transistors and neuron terminals could take parallel computing into a new era of ultra efficient high performance. While calcium ions and receptors effect a change in a biological synapse, the artificial version achieves the same plasticity with oxygen ions. When a voltage is applied, these ions slip in and out of the crystal lattice of a very thin (80-nanometer) film of samarium nickelate, which acts as the synapse channel between two platinum "axon" and "dendrite" terminals. The varying concentration of ions in the nickelate raises or lowers its conductance that is, its ability to carry information on an electrical current and, just as in a natural synapse, the strength of the connection depends on the time delay in the electrical signal. "This system changes its conductance in an analog way, continuously, as the composition of the material changes," explains Shi. "It would be rather challenging to use CMOS, the traditional circuit technology, to imitate a synapse, because real biological synapses have a practically unlimited number of possible states not just 'on' or 'off.'" 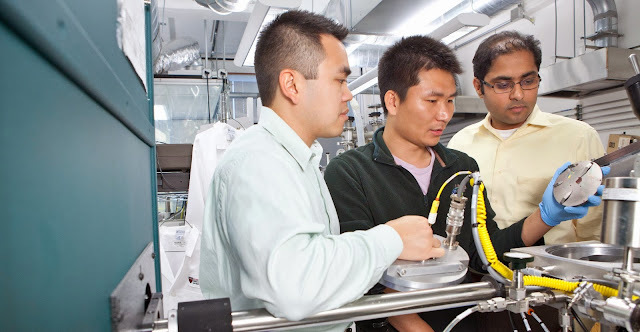 Left to right are Sieu D. Ha and Jian Shi, postdoctoral fellows at Harvard SEAS, and Shriram Ramanathan, associate professor of materials science. Credit: Eliza Grinnell, Harvard SEAS. "This kind of proof-of-concept demonstration carries that work into the 'applied' world," he adds, "where you can really translate these exotic electronic properties into compelling, state-of-the-art devices."